It has been said that great mastermind, Albert Einstein, once referred to compound interest as the “eighth wonder of the world.” If that’s true, then obviously ole’ Albert never lived under our nation’s present tax system. 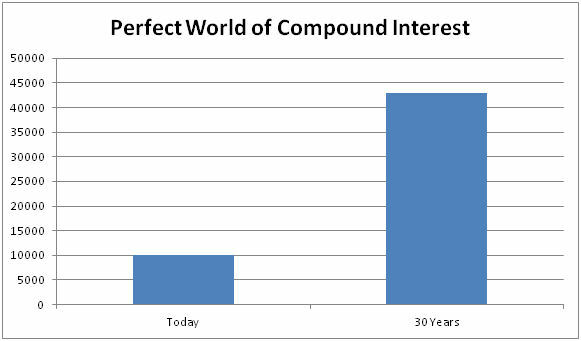 Nevertheless, most Americans are following the herd in thinking that “compound interest” is a good thing—and it would be if we lived in a perfect “tax-free” world. But we don’t. Certificates of deposits (CDs), taxable bonds, mutual funds, real estate, money markets, and individual stocks (just to name a few) can certainly grow (compound) to sizeable amounts of cash. The problem is, as most of these accounts grow and compound, so does the government’s fair share—called taxes. 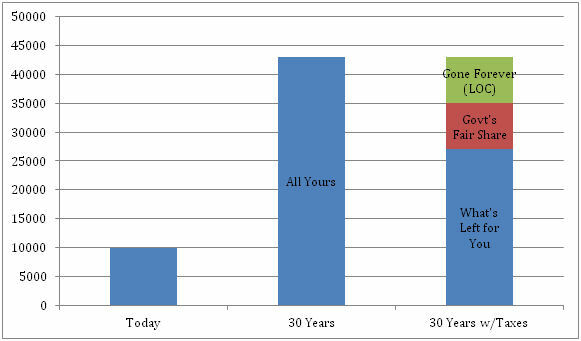 As you can see, the growth of the CD at 5%, compounded over the course of time, is quite “magical” indeed. But hold on, because the government has something to say about all this magical compounding. With any kind of growth, it now becomes your “patriotic duty” to share the “magic” with the I.R.S.—even if this means paying taxes on money that’s already been taxed (not a good thing). You see, whenever we have a cost (taxes each year), we also create another wealth-eroding problem called “lost opportunity cost” or LOC. So how do you avoid all of these taxes and LOC? Two options: you find financial products and strategies that allow you to defer the taxes (thus eliminating the LOC), or you deal with the original tax up front and avoid future taxes altogether. Bottom line: be sure you are working with an advisor who can help monitor your taxes each year. By lowering taxes, you are also lowering LOC, which in turn gives you more money to use and enjoy at no additional risk or out-of-pocket expenses to you. Talk to your financial advisor about all of your options. 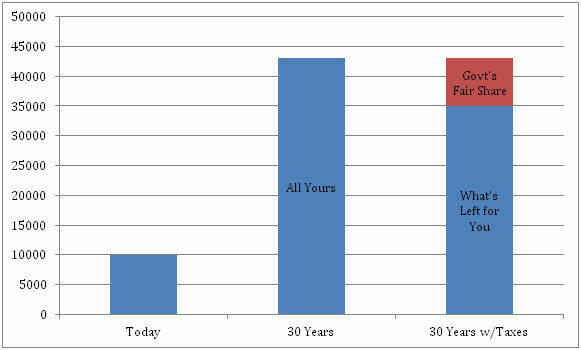 You’ll be glad you did… and will most likely pay less taxes as a result.